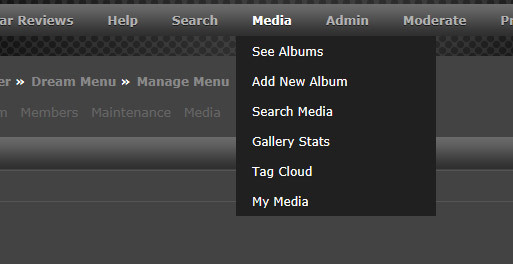 Is it possible to have a "My Media" link added to the Media button dropdown menu? No big deal if not, as you can find this on your profile page. Just be handy if it was in the drop down. Where exactly would it go? The area in profile where it lists the items you uploaded? This will then take the member who clicks on this link to their own albums page, (see screen grab below). Also while I'm looking at the second screen grab, another one of my annoying questions. Do empty albums show on the "See Albums" page for everyone, or just the person who added them? Reason I ask is your albums page could get messy if they show to all. I can certainly add the link. That'll be in the next version I do. No problem Arantor, I know this got added to CPG after numerous requests, hence the question. The My Media link was added in 1.0.3. Thanks. Will give it a go right now. Sorry, my server crashed straight after I uninstalled. So only just got it installed. Yep, I see the My Media button, that's excellent. Now going to view the changelog to see what other miracles you have performed. Ok, one thing I did notice was the TP front page block wasn't showing after I updated to 1.0.3, had to turn it back on. The other portal stuff, was it the spacing in the Latest and Random blocks you changed? There's a slight spacing between thumbnails. I'll post a link too my site if you want to check it. Yes, that's intentional; uninstalling the gallery disables any existing gallery blocks to prevent everything going to heck in the meantime with your portal. I did adjust the spacing on the portal blocks so they take up all the space in the block (and do so evenly) rather than squished up all together in the narrowest space it'll consume. Good idea, thought my host had been messing about with it. lol..
Ok, in that case it's not working as you described, for me anyway. Hmm, it was working for me on the test site - got a link I can take a look at? I tried IE11, Firefox, and chrome. Same result.